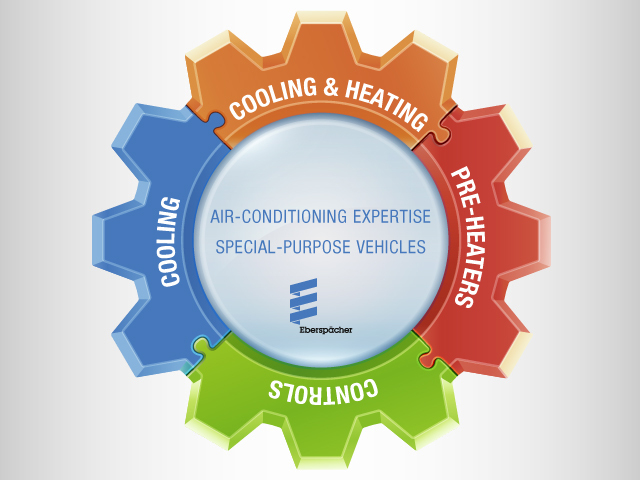 Effective vehicle air conditioning covers both heating and cooling components – requirements for which Eberspächer, a specialist in thermal management, offers effective solutions. In some areas, all the elements of an AC solution must be simple and robust, like the Special Applications sector, for example. All our products – from the rooftop-mounted AC system to the operator control system – are impressive in the very high quality they offer, and are ideally prepared to work together smoothly. From a multitude of components, we put together the right systems for you, and configure them individually for your needs.